I've been reviewing MLB The Show since 2013, and playing for much longer than that. That's six years of an annual franchise that at times has been stalled, unambitious, exciting, frustrating, and fun. Usually, my qualms showed when not enough has been done to help the series improve, or when previous issues start to get more annoying. But this year I don't have any of those feelings about The Show - instead, this year feels like lateral movement. Does that make it a good game? Sure. Everything that's always been good about The Show is still good here - there are even some gameplay tweaks that I really appreciate. MLB The Show 19 isn't doing anything outside the norm for the franchise, there are a lot of additions (including two new modes and an overhauled Diamond Dynasty mode), so a lot of work has been done, but everything that's new is a bit of a letdown. Luckily, the core of the game remains strong and that helps keep the game a reliable buy for baseball fans. It's important to call out the controls immediately. There's been a lot of work done to the fielding in the game that both helps and hinders you, the player. Fielding skills, like playing balls off the wall or anticipating fly balls, are influenced more heavily by a fielder's base skill levels and have less to do with your inputs. So, playing weird hops and the angles of the ballpark are something you don't need to worry as much about, unless you have a player in the outfield whose skills aren't very good. For a long time, fielding skills weren't that crucial, as they paled in comparison to how important hitting skills were in the game, and it's nice to see The Show accounting for players who excel on defense and flash the leather in big moments. The game also just feels a little bit better to handle this year. The developers have done an impressive job in highlighting the customizable control scheme, and this year that customization is upfront and rather simple. You can quickly make a few tweaks based on how you'd like to play, or if you're new, you can play a practice game and flip around the controls to see what you like best. It's a great way to get newcomers comfortable. Another noteworthy element to customizing your experience is the difficulty, which isn't new but is worth calling out for how much it still impacts play. You can choose to play at a specific setting, but you can also have the game to adapt to your skill. This means that for each hit you get, the difficulty will rise, but if you strike out, the difficulty will get lower. A dynamic skill level can be a great tool as you're getting your feet under you, improving quickly, but still perfecting your timing. The one issue I have is that the swing of the difficulty can be a little too much. You might get on a hot streak and the difficulty soars up two spots, then you're in a clutch situation and playing at difficulty level that's higher than what you really should be at. Or the opposite, a cold streak leads you to play at the Rookie difficulty and you just crush it for a bit. Yeah, I suppose it all evens out in the end, but baseball is a streaky enough game already without the influence of the dynamic difficulty. Pitching and batting mechanics have always been strong in The Show and this year is no exception. 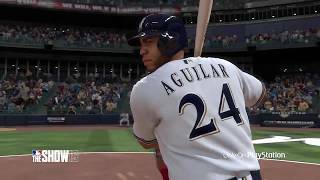 The mix of rhythm game mechanics and twitch analog stick movements is as satisfying as ever and there is no joy in any sports game quite like hitting a no-doubt home run and watching the animations take over as the ball sails into the stands. Base running is probably the most notable problem area, particularly when you're playing in career mode. Trying to locate the ball is difficult and it led to me getting into bad situations where I was thrown out. Stealing is particularly difficult unless your coach calls for it, because you're never given the opportunity to find the pitch you want to run on; instead the game skips immediately to the next time a batter will hit the ball or strike out - so you never have an opportunity to find a good pitch to run on. The biggest change to the traditional modes this year has been Road to the Show. Over the last three years, we've seen Sony San Diego taking cues from NBA2K and attempt to inject more personality into their career mode. This year is a continued evolution as you'll have more dialogue interactions with teammates, coaches, and rivals. During these interactions you can choose one of four personality types (Maverick, Lightning Rod, Heart & Soul, and Captain). The different personalities have different effects on the field and your teammates. It's a nice change of pace, as it injects more personality into the action. There are also mini-games that you can use to train your character in-between gamedays. The mini-games are unbalanced and very much feel like a hurried addition, but since they really only help you, it's not a big deal. Franchise mode has been largely untouched this year, which is a bit of a bummer. The mode is still adequate, but the UI remains clunky and there are still so many options to turn on and off, it's a bit of a mess. The Show is starting to get into a bit of the Madden NFL issue where it's been rolling along for so many years with so many options being removed and added, that it lacks focus at times. A brand new addition this year is the “Moments” mode. Here you can play moments from the careers of legends like Babe Ruth and Willie Mays, or re-play crucial comeback stories, like the Cubs 2016 World Series win. It's hard to see anyone getting much time out of a mode like this. It seems like something that's been stuffed into the game to add value. Baseball has a fascinating history and I appreciated seeing little flairs of style, like how the Babe Ruth moments are in black and white (since there is no television footage on The Great Bambino in color), but after playing a few sequences, I have had enough. Another new mode is March to October, which is basically like playing an accelerated version of a single-season mode. Parts of the season are simulated, but when your team is in a clutch situation, you play out the game - with success or failure impacting your team's momentum and resulting in a winning or losing streak. Single season modes have become increasingly rare in sports games, especially with how much work goes into Franchise alternatives, so this new mode is a little puzzling. The balance of simulation and playing games still leans towards playing a lot of the season. I played a part of almost every game in the first week of the season, making me wonder if this mode would really be that much faster than playing in Franchise. March to October is an interesting experiment, but I doubt many will be playing it over the more established modes offered. Diamond Dynasty returns but has also been overhauled. You can still play online games, conquest games, and other modes to rank up your team, but there's been a large reliance on using the new aforementioned Moments mode. You can play these quick Moments to earn cards and improve your team. I've always viewed Diamond Dynasty as an incredible time sink that doesn't have much of a reward, but I appreciate the tweaks that have been done to make it more engaging. It's still a little too convoluted (there's an overly long tutorial that teaches you how to upgrade players and your team), and unless you're a diehard fan, this is still safe to skip. Diamond Dynasty is where you're going to find yourself playing the majority of multiplayer and I've always been impressed by the stability of The Show's online performance. Years ago you'd have to swing sight unseen at pitches due to the terrible lag, but more recent versions of the game have been stable, allowing for the fun cat-and-mouse game between pitcher and hitter to play out over your internet connection. The core of the gameplay is still built around the AI and it doesn't quite translate to multiplayer, but if you're wanting to get deep into Diamond Dynasty, you'll find this aspect works as well as could be expected. The game looks as good and ever - and The Show has always looked phenomenal. The character models are detailed, the animations look the best they ever have - it continues to be a visual feast. The lighting, the hair, the faithful recreation of iconic fields - the game just looks great. There's also been an added feature where coaching comes out of the speaker in the PlayStation controller. It can be a little off-putting and the only phrases are generic things like, “Nice hit!” or “Run it out!” - but it's a cool little tweak. The pacing of the presentation is where the game's look has improved the most. The Show has always had a problem of making you skip through long, overly winded cutscenes, or drawing out your games to simulate the real presentation, but this year strikes a nice balance - moving things along quickly without breaking the illusion of watching a ball game on TV. 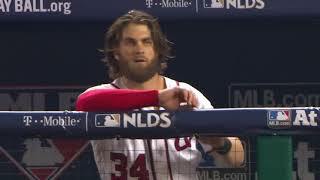 Ever since MLB has cut down on its load times, I've watched them carefully creep back up. They still aren't especially bad, but they're getting longer. This is more of a limitation on the hardware and proves The Show is starting to itch for a more powerful system, but really the game largely runs fine and that's always been a focus. With so much dependent on timing and rhythm, ensuring that it's a smooth-running game has been key and this year is no different. I do wish The Show 19 would turn auto-saves on when simulating through games. You can lose your entire offseason - including free agent acquisitions, trades, re-signings, and more - by accidentally hitting the wrong button, which is rather deflating. 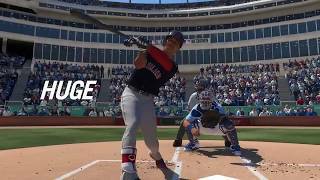 MLB The Show 19 is another in a long line of quality games from Sony San Diego Studio. It's not the breakthrough that the series had a few years ago, but if you've skipped a year or two, this is a great place to jump back into the franchise. Everything that's been good about the series is still here and even a little improved. If you're excited to have baseball back, and looking forward to warm days and cool nights spent watching the eternal struggle between pitcher and hitter, you'll thoroughly enjoy this year's MLB The Show. The Show has always looked great and 19 is no different. This year sees some nice improvements to hitting and fielding, though base running is still lackluster. While The Show 19 plays great, its many modes don't do it justice. Instead of cranking out March to October and Moments, I wish the developers would focus on the core gameplay. The online performance is strong, and while playing against others can fundamentally alter the experience, it's fun in its own right. Those loading screens are starting to get long again, and I wish the game had a better auto-save function. Still, it's a stable experience. MLB The Show 19 is ranked #682 out of 1435 total reviewed games. It is ranked #14 out of 39 games reviewed in 2019.